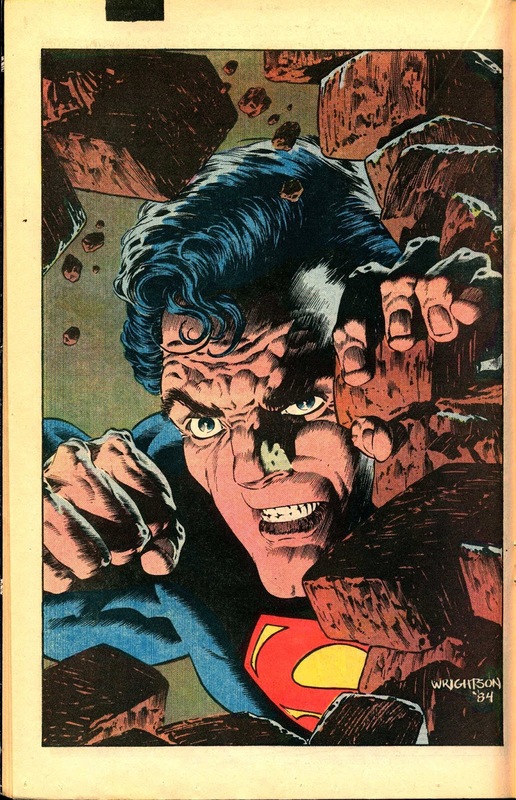 This is the four-hundredth post at Warrior27, and that number immediately conjures up memories of one of my favorite single issues of a comic book ever – the 1984 anniversary edition of Superman 400. 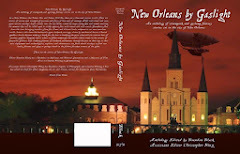 It’s a super-sized issue (it’s 64 pages & cost $2.00!) filled with superstar talent, and it is one of the comics I would bring to that metaphorical desert isle, if I were ever relegated to such a fate. Let’s start with that cover – a beautiful painting that feels more like a movie poster than a comic cover. 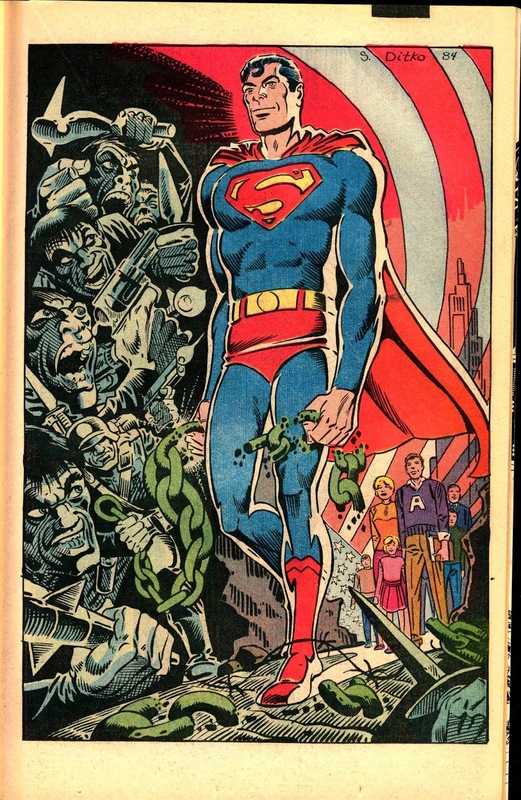 In a collage of images readers are given the story of Superman, with the Man of Steel front and center. It was years before I discovered this was drawn by Howard Chaykin, whose work I have come to admire greatly. His style is almost subsumed by his painting, but if you look closely enough, and know what you’re looking for, it becomes obvious this is a Chaykin piece (the signature hidden in the top stripe of the American flag also gives it away). Then, on the inside cover, we are treated to a quick introduction to the wonder of Superman and the importance of this character by legendary author Ray Bradbury, whose works of science fiction and fantasy transcended genre to become literary classics, in a manner parallel to how Superman, as a character, transcended the “gutters” of comic book publishing to become a worldwide icon. Fitting. The issue itself is divided between pin-ups and short stories. With a lone exception, these are all written by longtime Superman scribe, Elliot S! Maggin, and all of them relate legends that have cropped up around Superman in the future. 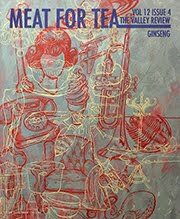 The variety in tone and point of view for these tales is impressive and far-ranging, and readers would be forgiven for not realizing they all came from the same typewriter. And every one – every single story – is great, in its way. After an introductory three pages drawn beautifully by Joe Orlando, the first story proper is drawn by Al Williamson. Set in 2199 on the lunar city of Armstrong City, we follow a futuristic snake oil salesman, regaling a group of locals with his tale of being rescued by Superman and the secret recipe the Kryptonian offered him, which became his “Superman Nectar.” It’s a fun tale that mixes a wild west setting – Armstrong City is modeled off the frontier towns of the American old west – with hovercars and other science fictional elements. Though the narrative is fun, the real star here is Williamson, who, not being anchored to actors’ likenesses as with his contemporaneous Star Wars work, really shines with his traditional, but beautiful, renderings. 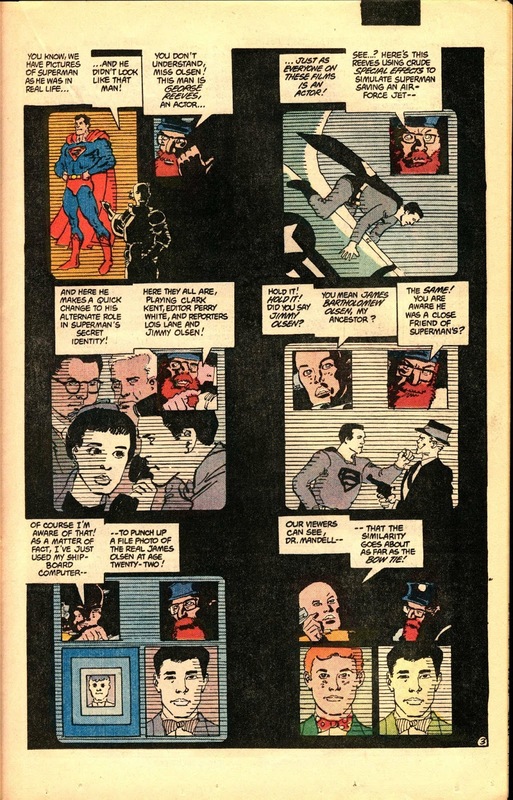 Next, we have Frank Miller drawing a story about scientists who have discovered the true identity of Superman. They use the unearthed video footage of the 1950s Superman television show starring George Reeves. 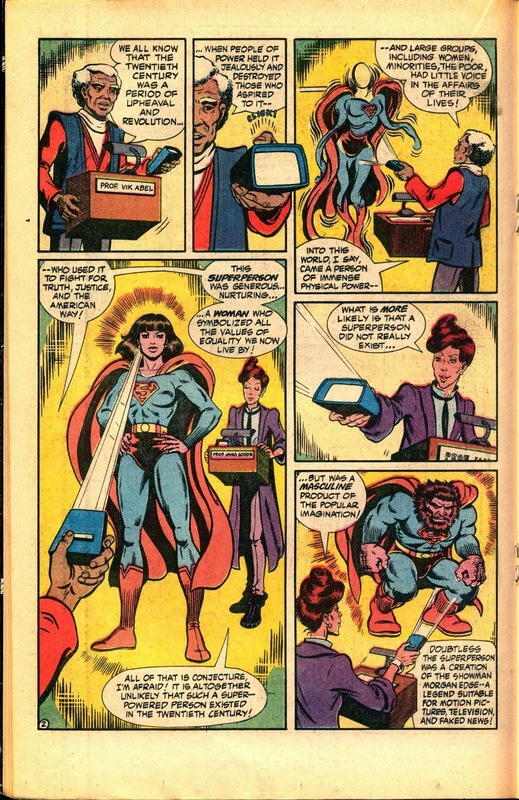 In that show, it’s revealed that Superman is actually Clark Kent – coupled with the inclusion of Lois Lane, Jimmy Olsen, Perry White, and others in the TV show, the scientists extrapolate the truth and offer it to this world of the future. Again, it’s a fun story that plays on the broader Superman mythos and gives readers an interesting take on the character that wouldn’t normally be included in the regular comic. 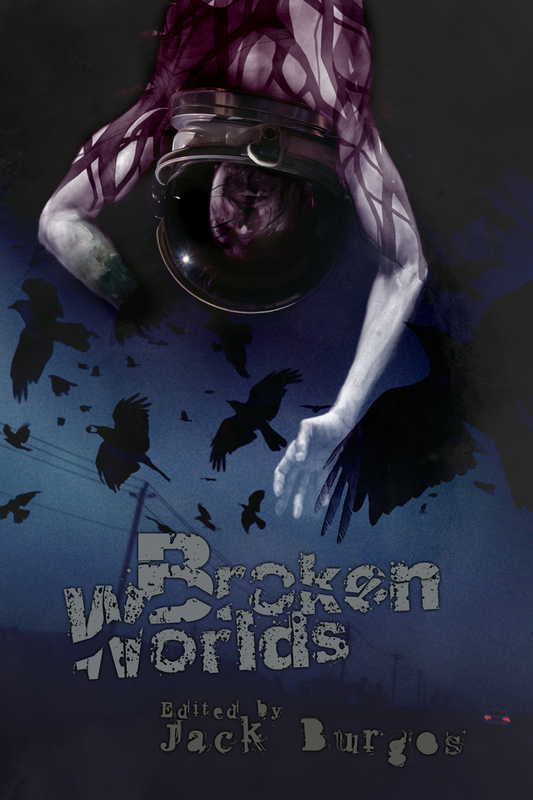 The next story is one of my favorites – a dystopian tale of repression. The future Metropolis is held under thrall by the Metropolis Militia, working for the rich to keep the masses under its militaristic thumb. 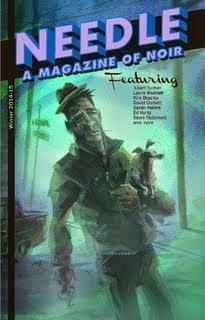 This tale follows a homeless man as Christmas nears. Cold, hungry, with nothing but the clothes on his back, he slips into the old library building to get warm and find a place to sleep. Looking for a blanket, he finds a Superman suit and puts it on. On his discovery by a guard, he is immediately fired upon … and the suit deflects the blasts. This leads the homeless man to rush outside and show the rest of the downtrodden how to resist. He shouts into the night, “Resist! Resist!” until the militia realize it’s the suit protecting him and fire at his head, disintegrating the man. But his cries of resistance shudder over the crowd gathered in front of the library. They push back against the militia, using their numbers to roll over the armed guards, and the dreams of freedom and peace that Superman inspired centuries past are born again. 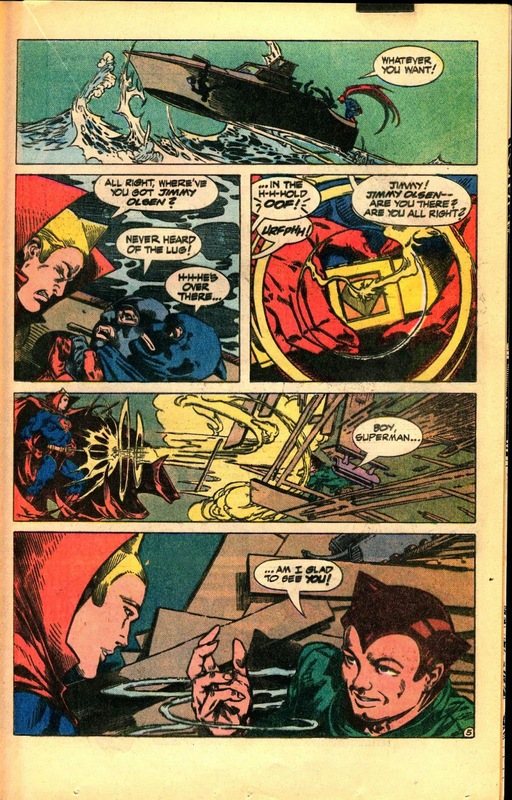 This story was drawn by Marshall Rogers & Terry Austin, and their work is stunning. Whereas I remember feeling that Rogers’s art for the Silver Surfer relaunch, which would come a few years after, was tired and uninspired, the work on these handful of pages is fantastic. Following this, we get a story drawn by Wendy Pini, whose “mainstream” comic work is few and far between. 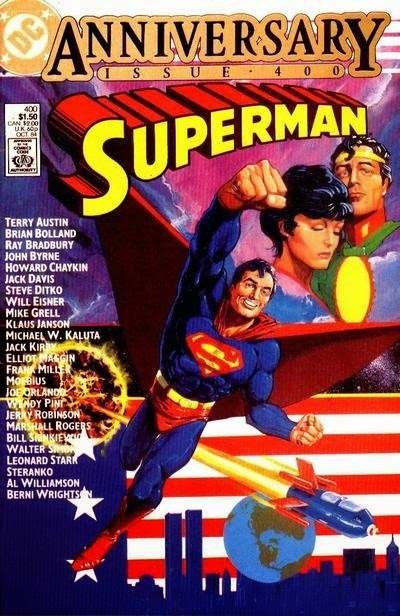 Set in space, on the off-world campus of Brandeis University, we follow a small group of students as they watch a video lecture, wherein two professors attempt to explain who Superman was. The debate devolves into a silly argument about which one of them is correct – one claiming the super-suit they are examining was used by an empowered female, while the other believes it was a “masculine product of the popular imagination.” The students eventually turn off the video, as the vitriol between the two professors reaches an extreme level, and Maggin nicely sums up the theme of this short narrative with his final captions. 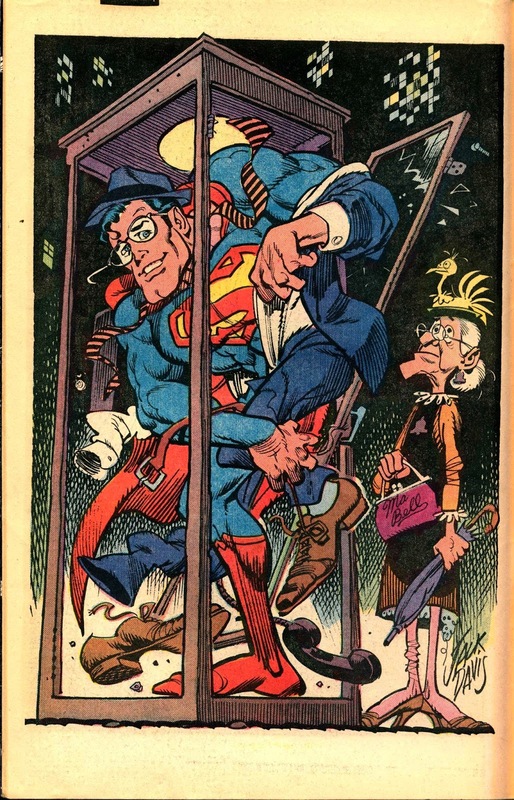 Michael Kaluta’s delicate linework brings the next story to life, which is a premonitive tale about a virtual reality “theater.” Two boys in this far future world run into each other as they enter the theater, where they are going to role-play a Superman story through pairs of special goggles. It’s an immersive experience, with one boy playing Superman, with his own imagined powers rather than those with which people are familiar, and the other playing the victim. In the end, the day is saved. And then it’s time for the boys to switch roles. Another really fun story elevated by Kaluta’s beautiful art. The penultimate story takes place in the year 5902, and is my favorite of the whole issue. Illustrated by Klaus Janson, his exceptional skill at delineating body language and facial expressions is something wonderful to behold. In this far flung tale, humankind has moved beyond war and famine and injustice, and every year celebrates Superman’s legacy with Miracle Monday, a day when all families come together for a special meal where each member adds food from their plates to the empty one reserved for Superman, against his eventual return. 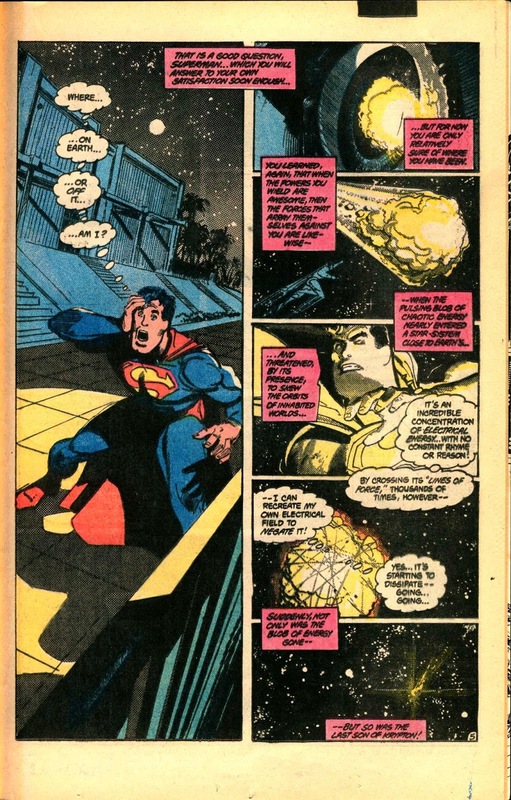 On this particular night, with this particular family, Superman is actually thrown through time and lands outside their home. Disoriented, he finds his way to their door, where the family assists him. Only one of them realizes Superman’s true identity but keeps it secret from the rest of his family. And, thankful for that and for the bright future he has now experienced, Superman returns every year – unseen by this family – to partake of their generosity and empties the plate, to the delight of all present. 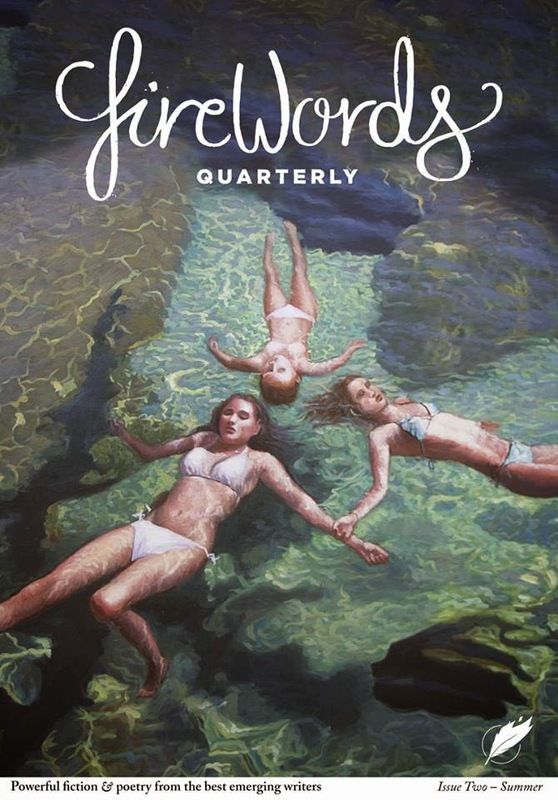 Yes, it hews a bit close to the Christ tale for me – something I did not see when I first read it – but I still enjoy the magic and beauty evident in this short story. Finally, we reach the one piece not written by Maggin. 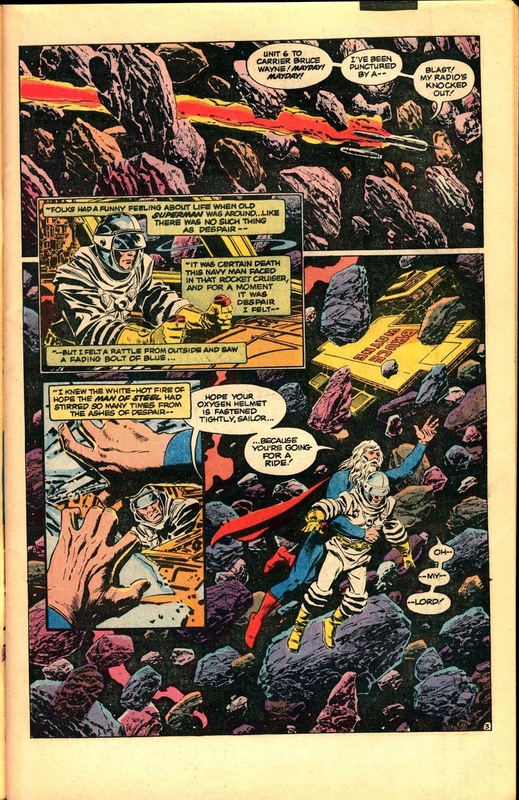 Jim Steranko writes, draws, letters, and colors the final story in this wonderful tome – “The Exile at the Edge of Eternity.” Told through captions and beautiful double-page spreads, this is the story of the end of humanity. 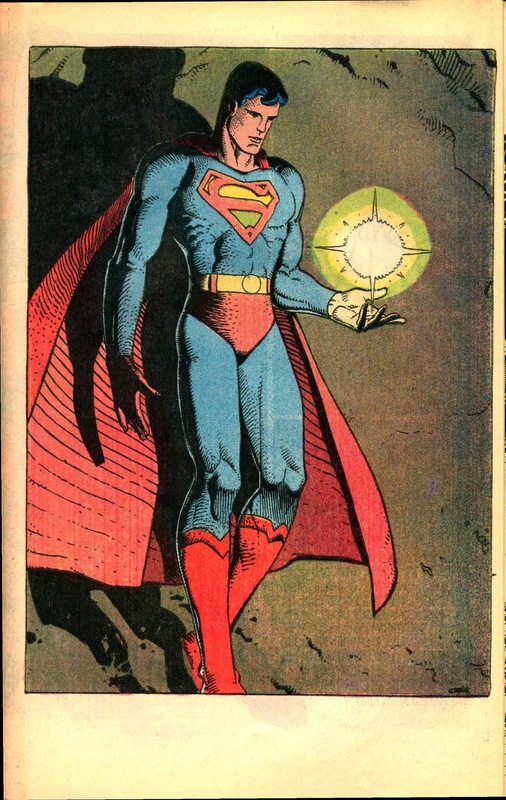 The last ancestor of Superman, whose DNA has intermingled with humanity for millennia, makes the ultimate sacrifice, focusing all the energies of the rest of humankind into ten beings in order to halt the death of the universe. 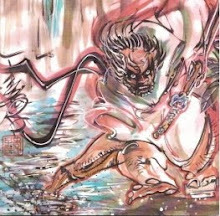 The unleashing of this energy, through the expiration of these ten beings, leaves the architect of this plan a mere mortal, who is now the last man alive in the cosmos. But it also spurs new growth and renewed life on Earth, and as this tale ends, a new Eve emerges from these energies, presaging a new beginning for humankind. Then, there are the pinups scattered throughout. These are phenomenal, adding to the already stacked deck of creators who contributed to this landmark issue. You saw the listing of talent on the front cover. 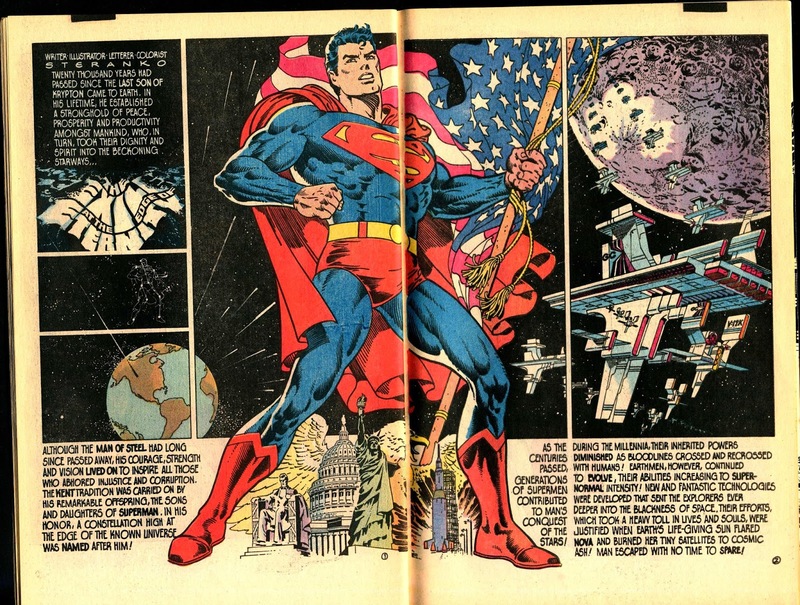 But if you’ve forgotten, there are some fabulous images from some of the very best ever to delineate a figure in these four-color wonders – people like Berni Wrightson, whose moody inks bring to life power of the Man of Steel, or Walter Simonson, whose distinct and strong linework showcases an exultant Superman astride a huge S-shield, held aloft by all of his supporting cast, or John Byrne, who was THE superstar artist of the day and would go on to revamp Kal-El two years later for the character’s fiftieth anniversary, or Jerry Robinson, the golden age artist known for his signature work on Batman, who has the dynamic duo swinging in for a Superman statue dedication ceremony, where a mayor looking very much like Ed Koch presides over a crowd filled with real-life celebrities and comic book characters alike, or Jack Davis, legendary Mad Magazine artist with his distinct rendition of Clark Kent’s quick-change into his heroic alter-ego, complete with an impatient elderly woman waiting to use the phone booth. 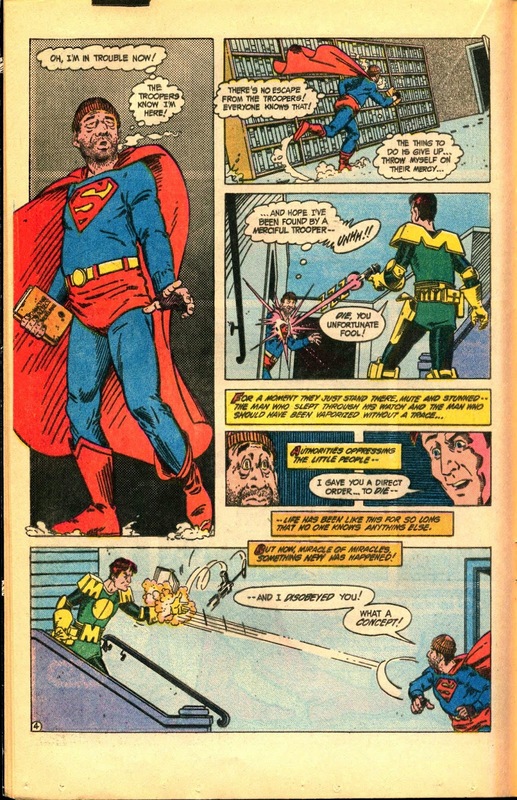 Brian Bolland lends a hyper-detailed rendition of Clark revealing his costume beneath a business suit, while Leonard Starr wishes Superman the best in the next 400 issues with a classic rendition of the Man of Steel flying Annie and her dog through the air, and Mike Grell offers up a stylish image of Clark Kent and Superman side by side, smiling out at the readership, with a golden S-shield behind them. If the above murderer’s row of artists sounds great, consider the fact that they are part of the undercard as four true giants of the medium also contributed to this landmark issue – Steve Ditko, co-creator of Spider-Man, Dr. Strange, and the Creeper, among many other characters, and the only artist who could match in production and quality another contributor to this issue, Jack Kirby, co-creator of the Marvel Universe, as well as the New Gods, Kamandi, the Demon, and myriad other notable characters; there is also Will Eisner, creator of the Spirit and one of those credited with the creation and eventual popularization of the graphic novel format, and Moebius, Jean Giraud, the French comic artist whose Arzach, Lieutenant Blueberrry, and various other creations showcased his supple and beautiful linework. All of these talents came together to make this an artistic feast for any and all fans of the comic medium. 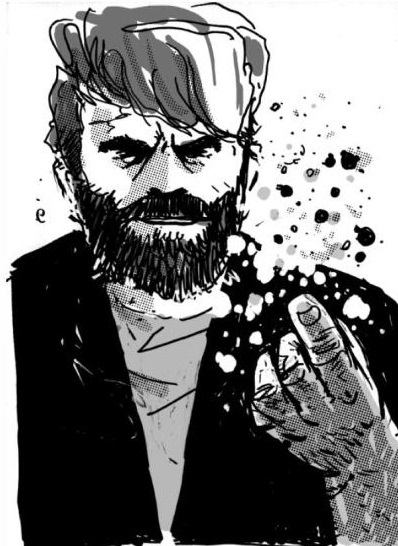 My favorite pinup, though, of all these heavyweight ink-slingers has to be the simplest image, which came from Bill Sienkiewicz. 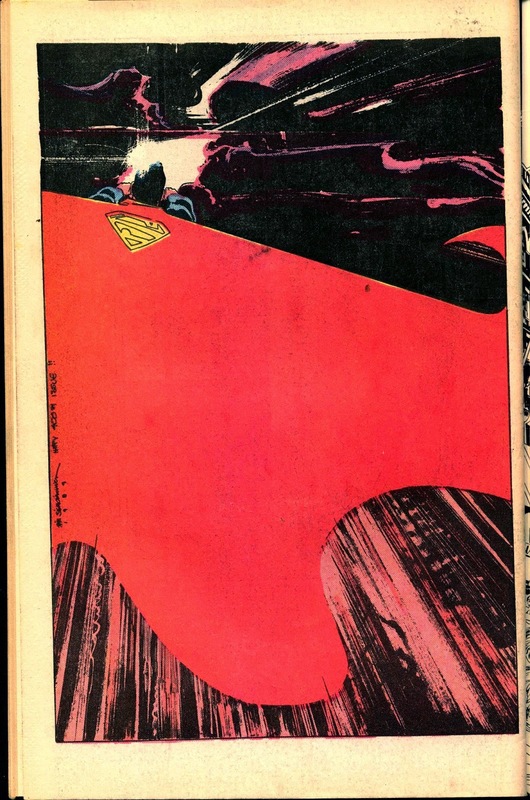 In the back of the book, he offers up a final farewell for the Man of Steel’s 400th issue, as we are treated to Superman flying away from us, at super-speed, with Sienkiewicz’s signature style elevating this far beyond the simple premise from which it was begat. Just beautiful. The smartest thing DC comics did, in preparing this special issue, was to allow the writers and artists to craft stories untethered by continuity. Given free reign, while not beholden to anything but the primary essence of Superman, imbues each of these tales with a timeless quality. And designing these narratives as legends set in a future where Superman has been woven into the mythic tapestry of humanity, adds weight to this heroic icon while also reaffirming truths about the ideals and mores for which Superman stands. These two aspects – the timelessness and legendary quality of the stories – are what allow for frequent re-reads of this book that never disappoint. So, for this 400th post, one of my all-time favorite comics. Superman 400. Check it out. I don’t think you’ll be disappointed.